Gilimbaa is an Indigenous creative agency. 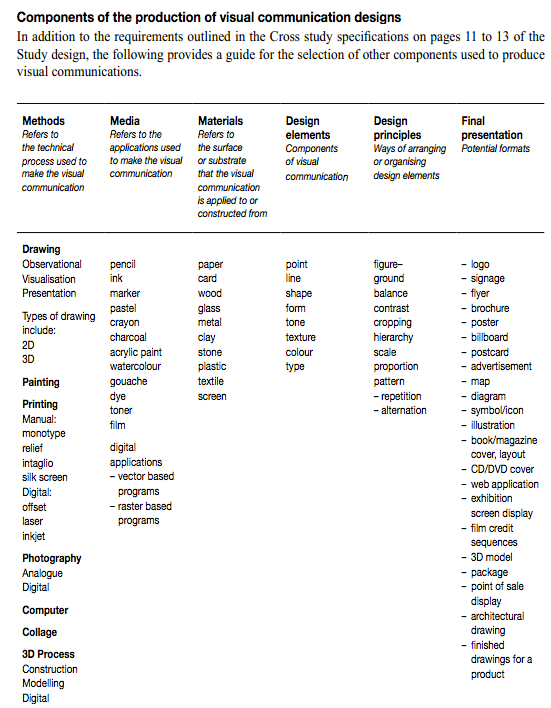 The Visual Communication Design study examines the way visual language can be used to convey ideas, information and messages in the fields of communication, environmental and industrial design. Designers create and communicate through visual means to shape the everyday quality of life for individuals, communities and societies. Visual communication design relies on drawing as the primary component of visual language to support the conception and visualisation of ideas. Consequently, the study emphasises the importance of developing a variety of drawing skills to visualise thinking. Media are the digital and non-digital applications used to make visual communications. Examples of digital applications include vector-based and raster-based programs. Examples of non-digital applications include pencils, ink, markers, pastels, acrylic paint, gouache, dye and film. Materials are the surfaces or substrates that visual communications are applied to or constructed from. Examples include paper, screen, card, textile, metal and plastic. Design elements are components of visual communications. For this study they include point, line, shape, form, tone, texture, colour and type. Design principles are accepted coventions associated with arranging or organising design elements. For this study they include figure-ground, balance, contrast, cropping, hierarchy, scale, proportion and pattern (repetition and alternation). Includes Graphic Design, Information Design, Digital and Web Design, Advertising, Print Publication/Book Illustration and Typographic Design, Package/surface Design and Logo Design and Brand Identity. Includes Architectural Design, Interior Design, Landscape Design, Set Design and Exhibition/Display Design. Includes Engineering Design, Product Design, Furniture and Fashion Design. Infront - is a collaborative project space and launch pad to Australia's best online designers, artists, design companies and other related websites. that are wrestling with poverty.